The University of the East, which marked its 70th foundation anniversary in September 2016, dates back to September 1946, when the late Dr. Francisco T. Dalupan Sr. organized certified public accountant review classes in two rented rooms on Dasmariñas Street in Manila, accommodating 110 students. Four of those reviewees went on to become topnotchers in the 1947 CPA licensure examination. Buoyed by this initial success, Dr. Dalupan and his associates opened the Philippine College of Commerce and Business Administration (PCCBA) in the summer of 1947. The PCCBA, initially located along R. Papa Street, soon settled at what is now UE’s Manila Campus along nearby C. M. Recto Avenue. The PCCBA was granted university status in July 1950, and was renamed University of the East, with Dr. Dalupan as Chairman of the Board and President. 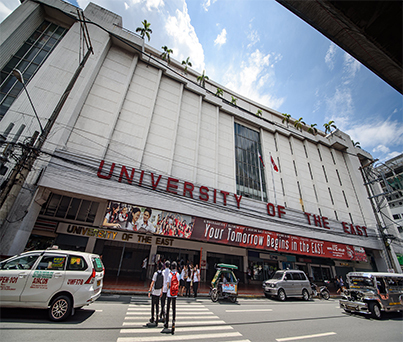 UE Manila, which was granted the Autonomous Status by the Commission on Higher Education and is a CHED-certified Center of Excellence in Information Technology Education, has the UE Graduate School and the Colleges of Arts and Sciences, Business Administration, Computer Studies and Systems, Dentistry, Education, Engineering, and Law. The UE Manila Elementary and Secondary Laboratory Schools provides basic education from the Kindergarten to Grade 12 levels. UE Caloocan was initially established as a vocational and training center or “UE Tech” in 1954. Granted the Deregulated Status by CHED and awarded as One of the Outstanding Institutions in Caloocan City by the city government, UE Caloocan has its own Colleges of Business Administration, Arts and Sciences, and Engineering, and the UE College of Fine Arts, Architecture and Design. The UE Caloocan Elementary and High School Department provides basic education from the Kindergarten to Grade 12 levels.